Paintball, or skirmish as it is also known, has been enjoyed by people all around the world for approximately 30 years. Its popularity has increased in recent years due to improved standards and equipment, however the aim of the game is still the same – eliminate the enemy before they eliminate you. Although no one is exactly sure on how the sport came into existence, paintball is now one of the world’s fastest growing sports and every week players of all ages are taking on the paintball challenge. People of all fitness levels and sporting ability play paintball, and no previous experience is needed. 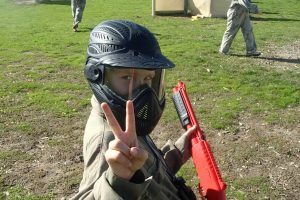 Due to differences in Australian law the minimum age to play paintball varies from state to state. Contact your nearest AUPBA-approved paintball field to find out the minimum age for your state. Whether you like the thrill of being the hunter or the hunted, paintball is an exciting sport that’ll get the adrenaline pumping. Picture yourself hiding in the bush. Your teammates are a stones throw away, awaiting your signal to attack. Have you got yourself into the right position? Will you come under fire as soon as you move forward? Have you got what it takes to lead your team to victory? 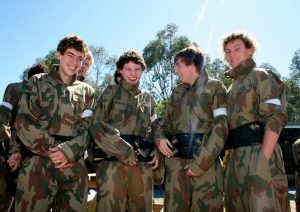 Paintball is unlike any other activity and it will bring out the Rambo in everyone. Strategise with your team before entering the playing field and work out a series of hand signals to ensure you know what your next move is going to be. Be sure to take advantage of the natural environment and attack the enemy when they least expect it. Utilise the layout of the land to roam the fields unnoticed and to get to certain vantage points. Choose your strategy carefully as one wrong move could mean defeat for you and your team. From special birthday occasions to youth groups, and corporate events to buck’s/hen’s parties, come and experience all that our AUPBA-approved paintball centres have to offer in terms of amazing game zones, impeccable safety standards and state-of-the-art facilities. Get your friends together and experience one of the fastest growing sports in the world.